The name Seikatsu confuses me. The rulebook says that it is a Japanese word meaning “life”, but all of my life I have associated “katsu” with deliciously breaded and fried cutlets. I mean, if there’s anything more life-affirming than fried pork, I don’t know what it is, but I doubt that’s the connection there. After some research none of the characters in the two words seem to match, but I also know literally nothing about the Japanese language. Is this the result of some lazy person translating the words phonetically into arabic script? Is there a verbal inflection I don’t know about that makes the “katsu” part sound different in the two words? Is there some kind of link between pork cutlets and life in Japanese culture of which I am unaware? 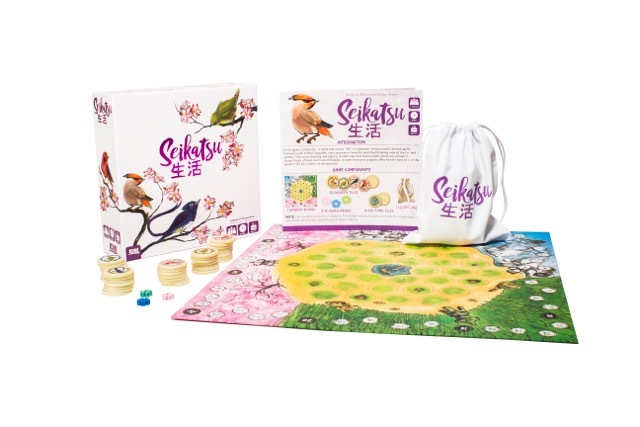 Seikatsu is a game about birds and flowers. It’s also absolutely beautiful. I think I’m a sucker for this kind of Japanese aesthetic. 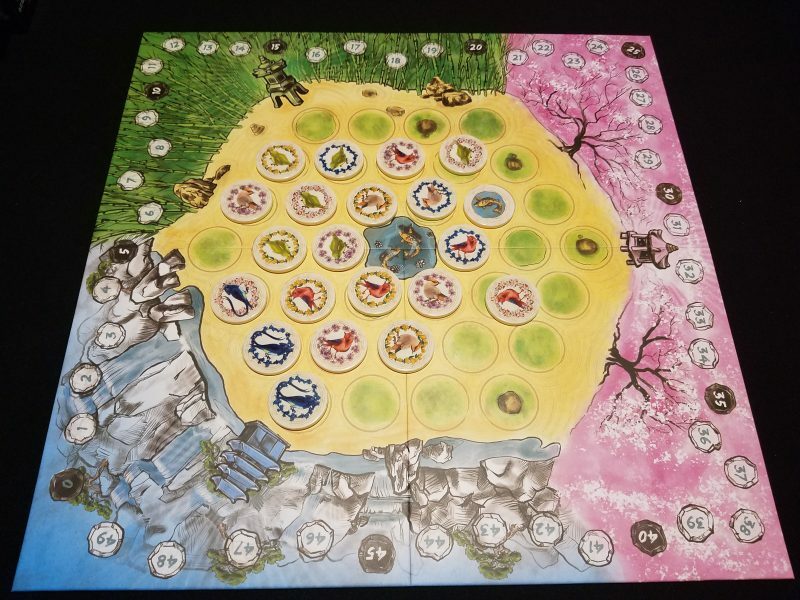 Tokaido sunk its pastoral claws into me first, and now I find myself wanting to play Seikatsu just so I can look at it. But how does it play? Extraordinarily simply, in fact. It’s a tile laying game about as simple as the genre allows. On your turn you choose one of two tiles and place them on the board adjacent to a tile currently on the board. You’re worried about both the birds on the tiles and the flowers. There are four types of each (all from Japan), and you score points equal to the number of adjacent matching birds, plus the bird you just placed. Think of the monasteries from Carcassonne, except you always score it upon placement. Easy. Then, at the end of the game you score points (in a triangle-number scale) based on how many matching flowers you have in each row on the hexagonal board. But here’s the twist–each player scores the rows from their perspective. Because it’s a hexagonal grid, the optimum player count is 3 players so that every straight row is scored. In fact, this game really is a 3 player game, even though the box says 1-4. The solo game isn’t particularly interesting, the two player game is perfectly fine, and the 4 player game is just a 2 player game with teams and nothing really to spice it up. But what a pleasant game. It’s like a cleansing sorbet in the middle of your gaming feasts. The board is beautifully illustrated and the tiles are pleasantly tactile. They’re not quite as heavy as the chips in Splendor but they feel nice in your hand and make satisfying clicking sounds when you’re rattling them around in the bag of mystery. Unfortunately the pink and purple flowers are a bit too similar to be able to conveniently distinguish them at a glance. I get the feeling that people with color blindness or other seeing difficulties might find the visuals annoying. Ultimately the game becomes a nice, light puzzle, as you’re trying to figure out how to maximize your points while not helping out your opponents. The perspective shifts are interesting and provide enough of a challenge to keep the game from being boring without inducing any kind of analysis paralysis–games rarely last more than 15-20 minutes. As with many light games, there are only going to be a couple of viable spots on the board to choose between in any given turn, but that’s enough for this kind of game. There’s a calming, relaxing quality to it. You look at your tiles, find a spot, and go. The only other wrinkle in the game is the presence of 4 koi pond tiles, which act as wildcards, but only upon placement and at the end of the game. As you play you get a sense of accomplishment as you make the already beautiful board more beautiful. The koi ponds themselves enhance the visual experience; they break up the repetition of the bird tiles. Don’t get me wrong, this isn’t a brilliant gaming experience that’s going to twist your brain or make you look at games differently. It’s not going to make you think particularly hard at all. But it’s not trying to do that, and sometimes that’s fine. It’s a game you can play with people new to the hobby, or while waiting for people to show up to game night, or as a nightcap after a long, brain-burning game. It fits that role well. It’s a completely inoffensive game. I don’t see anyone loving it, but I can’t imagine disliking it either. It provides a similar experience as Tsuro, but with more real decisions and strategy. It’s kind of a stepping stone into slightly more complex tile-laying games like Carcassonne–it gives you that fundamental tension between trying to advance your own score while trying not to help your opponents, just with a lighter touch. It won’t become a go-to game in my collection–it can’t compete with games with more interesting decisions and more player interaction, but it fits a niche. Seikatsu is a nice game.